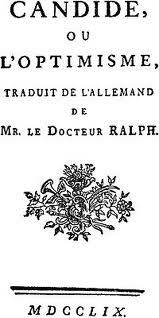 Written in 1759 (the same year as Tristram Shandy) this Enlightenment inspired satire is basically a statement in opposition to “”Therefore this is the best of all possible worlds,” a statement supposedly made by the German philosopher Gottfried Leibnitz (1646 – 1716) in one of his many works. Voltaire has his hero, the extraordinarily naive Candide, believe what his tutor, Pangloss says – (Pangloss was apparently a student of someone like Liebnitz). So Candide, bless is simple heart, really tries to keep the faith. Even though he loses his true love Cunegonde and Pangloss to Barbarians and the Inquisition – “things could always be worse” (to quote a totally different tale). And worse they got. Candide searches the world and comes upon one tragedy after another – one horror after another. Very difficult things happen to Candide and his varied companions. But that’s hardly the worst of it – I think it might be better appreciated with a bit of background on what Voltaire was criticizing. Voltaire is going after religion primarily, but also the monarchies. He essentially gets down to the idea that nobody is happy – and it’s an equal opportunity problem. This is a fantastical satire in the manner of Gulliver’s Travels – and I prefer Gulliver’s Travels. On the good side, it’s well written, funny in most parts, and short.